Dinghy as a Tow Boat? I was contemplating a scenario where the trawler was disabled and I needed to get a relatively short distance back to help. For example, in a port or on the river system. Would I be able to launch the dinghy and tow it back? How would I attach the tow line? Would the trawler just overwhelm the dinghy's ability to keep it going? Would the dinghy's transom get dragged under water? I realize there are many variables (weight of towed boat, type of dinghy, weather conditions) so there isn't any simple answer. Has anyone ever towed a trawler with a dinghy? What were the circumstances and results? What did you learn that you can share? Haven't done it but had a good friend who tried. Disabled 42' deFever, current carrying it toward the rocks, launched the Boston Whaler w/ 40 hp outboard, could barely hold the boat in one place against the current. Eventually as the tidal current grew stronger he had no choice but to give up. One big issue is where to attach the towline to the towing boat. If you attach it to the stern of the dinghy you will be severely limited in your ability to turn the dinghy and thus maneuver the boat you're towing. The towline should be fastened to the dinghy somewhere near its center of yaw, like on a tug. This will allow you to turn the dinghy even with the pressure and weight of the towed boat on the end of the line. Being able to easily maneuver the dinghy will make it that much easier to control the boat you are towing. Whether it will work for you depends mostly on the power to weight ratio. I have towed my disabled sailboat (10000 lb) with my inflatable, with 15 hp. tied on the stern quarter, made about 4 knots, complete control. Tried the 20000 lb sailboat, same dinghy and engine. made about 3 knots, not so much control, but in calm conditions, no problems. Tried the 44000 lb trawler, same dinghy, engine. Hopeless. next dinghy, with 20 hp, a little better, but still hopeless. Current dinghy, with 40 hp, lots better, but I wouldn't want to do it for long, as the turning is awkward, and you really need two people, one at the trawler helm and one at the dinghy. Using the dinghy as a docking pushboat works well. I have done so many times, when inserting an anchor boat into the middle of a big raft, it works especially well. I have helped many peole hold their boats in a current while setting a bow anchor and a stern line. Also pulled a sailboat mast over to lift his keel and help get him off a shoal, power dinghies are awesome! You will have better luck pushing from behind. Towing is not doable as it will be very hard to control the dingy. Pushing will surprise you, I can maneuver a forty ft house boat pushing with a 15hp on a 12' rib. Just did it with a disabled boat. I could do nothing towing it. My dingy just acted like a low powered out drive. Wind and current will determine the answer to your question. And obviously how much dinghy you have - my 3.5 HP Chinese knock-off won't go as far as a 50 HP Mariner. Even my little knock off works well as a pusher tug though. I'd be inclined to side tie the dinghy or use it as a pusher. Dingy can be used in a pinch for alot of things. i used mine on a grouded sail boat , took the extra line off the top of the mast, tied another 50 ft of line to it, and tied it around the top of the motor mounts on the dingy. i was able to heel the sail boat enough that they were able to power off in reverse. that was a 9.8 hp not alot but enough with the line tied so high up on the mast. So i reality i didn't pull the boat off the grounding just heeled it over enough that the keel was not dug i the mud. On two different occasions I used the dinks to push Volunteer, a direct pull doesnt really work.. the best is a side tie to the boat you need to move, favoring the stern and tied tight with spring lines. Use of the main boats rudder will help with direction once the boats are moving. I actually had better results with the 11' with 15hp vs. the 13' with 40hp of my two inflatables. It does work in calm water ... but a swell or waves would make it very interesting! I'll be keeping that in mind, should we ever become disabled. great idea! I'm using a 10ft Livingston and don't see any way to tie a tow line near the center. Even if I did, it would inter fear with the engine. I like the pushing approach but don't see any way to push on the swim platform with the Livingston's sloped cat style bow. I'll have to give that some thought. The side tie with spring lines seems to be the most workable perhaps with a second person at the helm to help steer. This would require a good fender setup to keep from damaging the hull. Not to hi-jack the thread, but there was some talk in previous posts about affixing a low HP motor to the swim platform. I have considered building a mounting bracket but I think with the height of the platform above the water I would need a long shaft outboard unless I cantilevered the bracket downward. Maybe temporary bolt on unit which can be removed for non emergency cruising....Hmmmm...sounds too complicated. RT, I've seen sailboats with the cantilevered motor which they can swing down to achieve proper depth. Perhaps you could check with a marine supplier for such a bracket. I tow boats up to the 50 foot range all the time with the 12 foot livingston. There is no one way is best. I cant safley do that in all conditions. I use all the meathods metioned including the double tender system with one tender off the bow and one teathered to the stern for control in the river current. There is just a ton of variables. Motors mounted and the stern of a flat backed trawler will have issues with bighting into clear water. Even in a small chop the outboard can have problems recieving constant cooling water with the pitching of the Trawler. Be carefull. I use a ski rope type bridal off the stern of the tender that allows the tow rope to get a better angle to the tow. Low to the water as there is no way I can mount a tow post. But any thing mounted high to tow from will pose risk of rolling over the tender. I have towed many people with my dinghy after Hurricane Katrina. When I tried pulling with a line the dinghy wandered all over and the trawlers and sailboats had no control either. 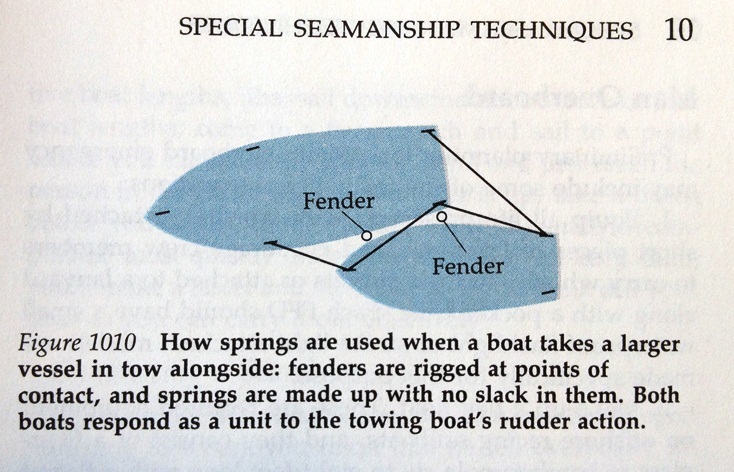 I then tried what the tow boats do sometimes in the channels. It's referred to as 'towing on the hip". Tie your dinghy tightly broadside to the trawler using several spring lines. I pulled 30,000 lb boats with a 10' inflatible and a 4HP O/B. I didn't win and speed contests but it does work. I needed 0ne person in the towed vessel to steer and to see where I was going. In the dink, I could only see to port and about 40% vision forward. We crawled but during an emergency 'whatever works'. A good towboatman once stated the essence of towing "It's more important to have the horsepower in the wheelhouse than in the engineroom." I use all the meathods metioned including the double tender system with one tender off the bow and one teathered to the stern for control in the river current. That is a very effective method for precise control in close quarters. My plan is to anchor and call TowBoatUS. Actually, my plan is to keep my boat maintained to the best of my ability. Plan "B" is to call TowBoatUS. Friends with an identical to mine dinghy and motor have towed disabled 18' bowriders a few hundred yards to the local boat ramp with great difficulty. I don't see my dinghy moving my trawler very fast or very far. Rick: Pretty amazing. I like the 2 passing. Are the big guys using their engines at all? The passing was impressive! We wondered ourselves if there was going to be enough room to swing the stern but the towboat guys do it so often they make it look sooooo easy. The yacht engines are idling in neutral and the rudders are midship. The tugs ahead pulls ahead and the guy astern is being towed backwards and acts as a rudder and pulls the stern around the corners where it is really tight. That boat that passed on our port side and then ran ahead is a 112 footer that didn't need tugs to make the sharp corners. Bigger boats commonly use the tugs because the cost of a tow compared to even a minor screwup is pocket change.